TKM Custom Rods is a family owned and operated custom street rod shop in upstate South Carolina. Our goal is to build your car, totally customized to your wants from only the highest quality parts. We offer a wide variety of different street rod models, from the '32 Ford to the '40 Ford, from the roadster to the pickup. Some of our latest items are classic 50s, 60s, and 70s muscle cars that we restored. Visit our Gallery for pictures of our work. We have street rod bodies and chassis, street rod parts and muscle car parts for sale. We do antique and muscle car restoration as well as auto body refinishing. We also do chassis conversions and upgrades, sound system sales and installation, and air ride suspension sales and installation. In short, we can help you with just about anything. Just contact us if you have questions or want more details on a certain product or service. We have built partnerships with a number of quality suppliers in order to give complete your custom street rod. If you're into kit building, or want to build your own street rod, we can also supply you with additional knowledge, expertise, parts and supplies. We have compiled a list of sample prices so you can get an idea what your street rod could cost. Click here to download/view the .PDF file. We put our skills and training to work for you. It's your project, your street rod. We'll show you the options from our wide range of suppliers, you choose the options, and we'll put it all together. Your custom street rod will be a unique showcase of your personal tastes; a work of art on wheels. Your satisfaction is guaranteed when you allow TKM Custom Rods to craft your own custom street rod. We have compiled a list of sample prices so you can get an idea what your street rod could cost. Click here to download/view the .PDF file. We look forward to hearing from you. Check out the rest of our website and contact us if you have questions. Have a great day! 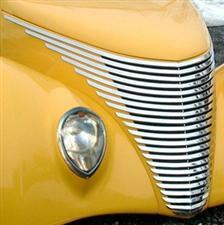 We offer a large selection of parts for street rod building and customization. We are dealers for the most commonly used manufacturers of chassis parts, AC parts, GM, Ford, and Chrysler performance parts, and street rod parts from over 50 manufacturers. If you would like the experience of building your own rod, you can purchase a rolling chassis and all the parts from us. We'll help with the whole building process; making recommendations, providing support etc. We purchase our parts from reputable American manufacturers, people who love these cars like you do. Browse the different parts we have available by section listed below. Click on the picture or title to see details. We use bodies made in the USA, by reputable manufacturers. We have two street rod bodies in stock for quick turn around. Please contact us if you would like more information or would like to purchase a body. One of the quickest ways to get your own street rod project off the ground is with a rolling chassis. 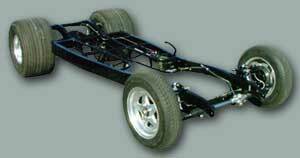 A rolling chassis includes brake system, steering, necessary mounting brackets, etc. Couple a rolling chassis with a body to really get your street rod project off the ground. Options, options and more options... It can be overwhelming at times, but it's the only way to get a completely custom car, designed by you according to your tastes. Grills, tops, suspension, audio, etc. the list goes on. We are here to present you the options as well as help you make informed decisions. If your street rod project turns into a daunting and intimidating process, the fun will be gone. We don't want that to happen, in fact, we're here to make sure it doesn't.